According to WarIsBoring.com, the United States at one point considered building an orbital railgun the size of the International Space Station. Tentatively titled "Have Sting", a number of documents both classified and freely available testify that we once wanted some serious fire in the sky. The autonomous cannon-esque rig would have boasted an array of technical feats from "power to attitude control, sensors to thermal control", according to aerospace historian Scott Lowther, who has been researching how close we came to actually having Have Sting. 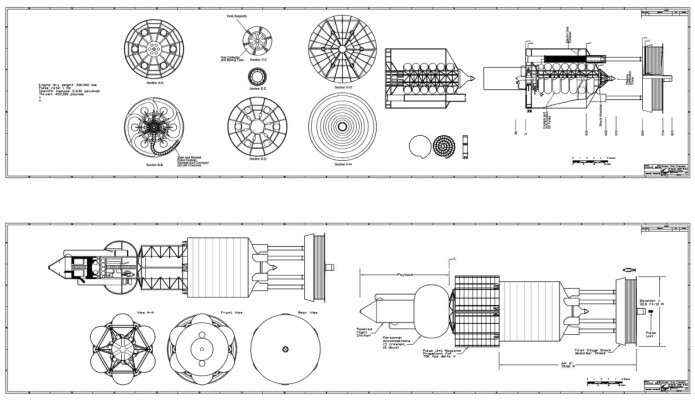 Do NOT try this at home: schematics for the orbital railgun. Sans traditional propellants, the railgun would have used a conductive projectile, which would be hurled by electromagnetic force. The rails that conducted the force would generate more power depending on their length, hence a weapon the size of Have Sting (265 feet, based on known possible reactor sizes) would be able to chuck space-based bullets at up to 35,000 miles per hour. That ridiculous reentry speed would be fast enough so that "a projectile as small as a can of beer could vaporize a hardened warhead." A nuclear reactor, a cryogenic tank farm and phased-array radars would also be aboard for the facilitation of said space warfare. The tanks would be full of liquid hydrogen and liquid oxygen that would oxidize to drive a turbopump, which would charge the battlestation. The reactor would generate enough energy to keep the Have Sting in orbital operational order during peacetime. Even just the regular Earth-based railgun is pretty badass. So why no real-life Death Star? Turns out, targeting something the size of, say, the planet Alderaan - that's pretty easy. But negotiating orbital trajectories and atmosphere for an exacting strike on a significantly smaller land target? Quite a bit more difficult. The recently voted-in SPACE Act would probably need a lot of amending (not to mention basically all of the international rules of warfare) should a weapon like this actually come to fruition. But you've got to applaud their ambition. We can just see the Emperor's electric hands sparking with evil glee (gleevil?) at the thought of this battlestation. But who knows where a railgun might show up next on Earth? That's a real force to be reckoned with. the Rebels wouldn't have stood a chance.